Just as the Northeast recovers from its major blizzard, Saturn has to upstage the whole thing with the reemergence of the Great White Spot, a massive storm system in the planet's southern hemisphere that can be several thousand kilometers across. The Great White Spot is the lesser known, Saturnian equivalent of Jupiter's Great Red Spot. It's the name given to periodic storms that flare up about every 28.5 years, previously showing up in 1876, 1903, 1933, 1960, and 1990. As such, we shouldn't be expecting another appearance until around 2018, although huge, Spot-like storms do occasionally show up at times that don't fit the cycle, including 1994 and 2006. Storms like these are thought to be created by thermal instability, which throws up tons of material from the planet's lower atmosphere up into the higher regions. When these storms overlap with the turning of Saturn's seasonal cycle every 28 or so years, the storm becomes so massive that it can encircle the entire planet, creating the Great White Spot. "Just down on the ground today ... our cameras on Cassini have captured sight of a gigantic storm recently erupted in the northern hemisphere of Saturn. This storm has been sighted by the amateurs in recent weeks, but Cassini was finally in a position to take a splendid series of pictures of it. And what a storm it is! ... 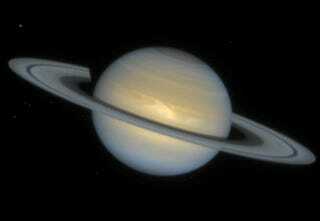 It only goes to show: It pays to have a sophisticated observatory in orbit around Saturn." Technically speaking, we don't know yet whether this particular storm will develop into a full-fledged Great White Spot. Of course, even if it doesn't technically qualify for "great" status, we're still talking about a storm system that you could fit this week's northeastern blizzard into a dozen times over.